Among the first experiments at the National Synchrotron Light Source II—NSLS-II, a U.S. Department of Energy (DOE) Office of Science User Facility located at DOE’s Brookhaven National Laboratory—were studies of irradiated steels similar to those used in nuclear reactor pressure vessels (RPVs). The purpose of these experiments was to determine the structural properties of nanoscale features that lead to embrittlement in RPVs, and the findings will help regulatory agencies determine safe operating lifetimes for the nation’s existing fleet of nuclear reactors. Results of the experiments are detailed in the March 2016 issue of the journal Scripta Materialia. The nation’s 100 operating commercial nuclear power plants produce roughly 20 percent of the electricity used in the U.S. and are vital to ensuring a steady supply of energy while helping the federal and state governments meet carbon reduction goals. Understanding how reactor components age when subjected to intense radiation, temperatures, and pressures is crucial information for regulatory agencies overseeing and certifying these nuclear plants for continued safe operation. Massive, thick-walled steel pressure vessels are permanent nuclear reactor structures that are constantly exposed to neutrons from the adjacent reactor core during normal operation. These neutrons cause the steel in the vessel to become brittle over time, increasing the risk of the pressure vessel fracturing or failing. To extend reactor lifetimes, the Nuclear Regulatory Commission must be able to ensure that large safety margins against brittle fracture are maintained at the higher neutron dose associated with more than 60 years of reactor service. In the NSLS-II experiments conducted at the XPD beamline, synchrotron-based x-ray diffraction and small angle x-ray scattering measurements were used to characterize highly embrittling nano-scale precipitates that can develop in the irradiated steels and are not accounted for in current regulatory models. Traditionally, neutron scattering has been used to measure these precipitates and is complementary to synchrotron techniques, which are much faster, allowing for higher throughput. 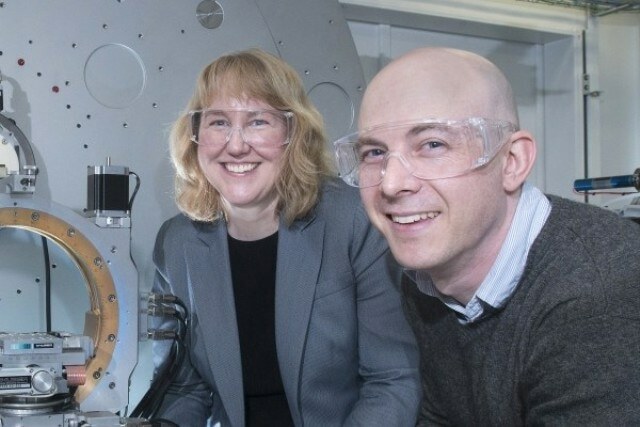 Analysis of experiments at XPD in combination with data from high resolution x-ray diffraction at the NSLS and atom probe tomography experiments have, for the very first time, successfully identified the crystal structures of the nanoprecipitates. Most reactor licenses have been extended to 60 years, and the Nuclear Regulatory Commission is working to determine if they can be further extended. An RPV is a large piece of equipment that would be prohibitively expensive to replace, so if an RPV was not deemed safe, it could essentially shut down an entire plant. The irradiated samples used in this study were provided by the University of California-Santa Barbara, courtesy of G. Robert Odette, another of the paper’s authors. The research is funded through the DOE’s Nuclear Energy Enabling Technologies (NEET) Program. The project will be ongoing until Sept. 2016.